Today Microsoft announced its plan to open 32 holiday pop-up stores for consumers who prefer a more tangible shopping experience. These stores are called "pop-up" stores because they are temporary, strategic installments intended to give shoppers more options for purchasing PC-related items during the upcoming gift-giving season. 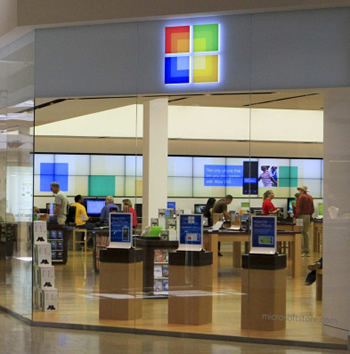 Currently, there are about two dozen brick-and-mortar stores under Microsoft's command. By the end of 2013, that number is expected to nearly double to 44 permanent retail locations and before 2015 rolls around, Microsoft has stated its intent to have 75 locations in operation. By comparison, Apple currently manages about 300 retail stores globally. Microsoft stores, unsurprisingly, sell PCs, PC accessories and PC software titles exclusively. Microsoft's online store frequently throws some alluring deals too, like bundling a free Xbox 360 with the purchase of any laptop or offering deep discounts on certain computers. Although Microsoft's spokespeople won't confirm if these stores will be open in time for Windows 8, it seems like a fantastic deadline for introducing more retail locations. Windows 8, in case you haven't heard, is slated to hit shelves on October 26. Although Microsoft won't speak about specific timing, the company has provided a list of locations which are expected to open. The 32 stores will appear in both the United States and Canada. There is no word on whether or not any of these pop-up locations will remain open beyond the holidays; however, additional more details are to come in the following weeks, according to ZDNet's Mary Jo Foley.